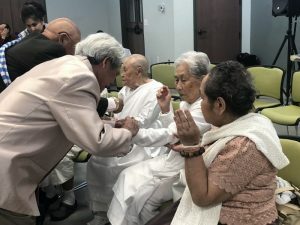 Lilburn, April 6, 2019 — M&J Foundation, Inc. hosted a Senior Appreciation Day for the Laotian Community in Georgia. Ann Rithmyxay, current board member of M&J Foundation, past president and co-founder of Laotian-American Society, chaired the event along with her esteemed volunteers. Also hosted by M&S Homecare Services, CEO Jamil Imran and current President of M&J Foundation. M&J Foundation, Inc. provides social services to individuals, families and seniors, to assist in every day challenges. The Foundation helps to stabilize crisis by providing the initial steps, partnering with businesses and organizations, working on projects or providing resources for Gwinnett County. With the assistance of M&S Homecare Services, GA Beauty School, and other businesses and organizations like Laotian-American Society, the Senior Appreciation Day was able to offer a memorable day for the elderly in the Laotian community. Seniors were able to have a free blood pressure check to ensure their health, and then pampered by getting a manicure and hand massage. The event started out with a Baci Soukwan “Ceremonial Blessing” to jumpstart the Lao New Year in April. As part of the Lao New Year Traditions, children and families are to pay respect and give blessings to their parents and grandparents. Lunch was then serve offering the famous Papaya Salad and Sticky Rice. A beautiful fruit carving and delicious coconut dessert was a must have. A beautiful Laotian Blessing dance was perform honoring and blessing those who came that day. Ending the afternoon with “lum vong”, a traditional circle dance played by a band from Texas, to give a chance for the seniors to dance and enjoy a day all about them.